!! OMG, he’s gay: T.R. Knight !! 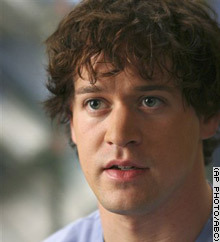 I don’t know who he is as I don’t watch Grey’s Anatomy, but I figure some of you do and would be interested to know that actor T.R. Knight has announced he is a homo, but hopes that “isn’t the most interesting part of me.” I hope so too, for his sake, as I find gayness pretty f*cking boring. 1 Comment on "OMG, he’s gay: T.R. Knight"
I knew T.R. when he was a little boy. He played Tiny Tim for three years at the Guthrie. I haven’t seen him in decades, but I congratulate him on coming out in public. It’s not an easy process and as long as more gays and lesbians, especially celebrities doe that, it will make the process easier for others. Congratulations, T.R. Good for you!